The lightweight DR-10C runs for hours on a single AAA battery. Don't understand the.specific models for specific mikes? What if you have olympus mics? Of course specific, as connectors are specific. But you can buy third party converters if such exist for your mike. Very practical device. Not sure I like the auto gain, if it's not well calibrated it will cause audible pumping effect. Nonetheless, the initiative should be applauded, hope the pres are clean. @Sph1nxster The Sennheiser is 1/8" so that may work. I had similar situation with using a Tram TR-50 lav mic prepped for Sennheiser wireless pack with 1/8" plug. I wanted to use it with my Roland R-05 recorder. I called Tram and asked if I could run mic by plugging it into regular recorder, and they said they couldn't recommend, but tried it and it's worked perfectly for over a year. So maybe if your Olympus is 1/8" plug it would work on Tascam model with Sennheiser 1/8" input. Maybe call Tascam or Olympus to check if mic or recorder would be damaged. This is great... I've been waiting for Juicedlink to release their LittleDARling, but the release time frame of summer has passed, and they're still working on it. According to Tom Duffy at Tascam, this will ship in November at price of $199. Backup attenuated track is great! It's a shame that Jucedlink seems to be late on their release schedule. I was waiting for it, too, even though their price is a mystery. There are no pictures of its rear side. Does it have a belt-clip? I was waiting for it, too, even though their price is a mystery. I think we had reference for price in corresponding topic, it is >$350 as I remember. A little disappointed it's not closer to the $100 mark, I would've bought two at that price. Hard to see how they can command the same price as a DR-60 with so few components included in the design. If Tascam really wants to innovate in this space they should package a DR-60 with two of these and add a wireless timecode sync feature. They could charge $500 for the package and sell a million of them. For now I'll wait for price drops. A little disappointed it's not closer to the $100 mark, I would've bought two at that price. Hard to see how they can command the same price as a DR-60 with so few components included in the design. Well, for the guys who use two pairs of good wireless systems and good mikes for them, and for projects where you need sound with warranty (and this is exactly that it is for), it is strange to save on it. If you just use recorders without wireless, you do not need it. Yeah, I ran into a situation recently where my G3 had a small level of interference and while the sound was still usable, this recorder would've been more than ideal as a backup. I will probably still buy one at launch - before I live to regret it. Perfect product for me, at last I can retire my 2 Zoom H1's that I was using for this purpose. The backup track at reduced db makes this price point worth it. MIC input gain LOW / MID / HIGH - only adjustable in 3 steps, that's strange and my only concern. Well, it is three settings of preamps as on other Tascam recorders. You can adjust level additionally, of course. Ok thanks VK, never owned Tascam products so didn't know about the additional variable level adjustment. I addition to using the Little Darling as a lav setup I was thinking to use it with a Videomic Pro for an ultra compact setup, like with the H1, for doc work - So my question is if the DR-10c can be adapted to take a mini jack, and if yes if it's advisable? The biggest cost here is not the recorder but the mics. Wonder if there are cheaper options that will work well, in terms of connector, impedance, power draw etc. I placed a pre-order for 2 of these on Amazon last week... now apparently tascam's website says they're not going to be available in the US. wonder if there's a patent issue or something with the Juicedlink LittleDarlings, or maybe thats why the LittleDarlings have not been released. I believe the issue with both the Juicedlink and Tascam offerings has to do with Zaxcom patents. Any reference to this patent? As I am not sure that you can patent obvious ideas. I don't have any patent details. 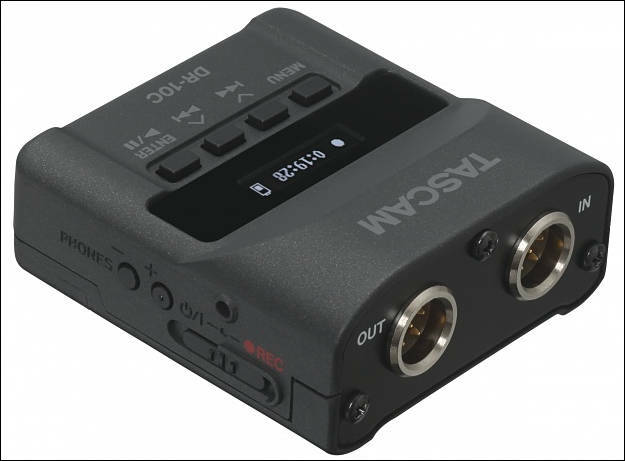 I'm just following a Tascam topic over at http://jwsoundgroup.net/index.php?/topic/23090-gotta-love-the-innovation-coming-out-of-tascam-at-the-moment/page-2 and Glen Trew, who runs Trew Audio, has spoken to Zaxcom about it.